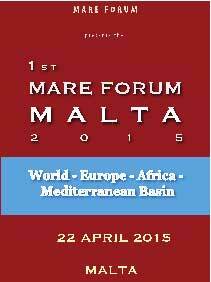 On 22 April 2015 Mare Forum will host the 1st Mare Forum Malta 2015 conference at the Grand Hotel Excelsior. The Mare Forum conferences are considered by many to be among the most global and influential forums for the maritime and shipping industry. Currently events are held in Europe, North and South America, South East Asia and the Middle East. Considering Malta's geographic position between Africa and Europe and its important role as a great shipping nation, Mare Forum in collaboration with GM Conferences and Exhibitions Ltd and supported by the Ministry for Transport and Infrastructure and Transport Malta will host in Malta an annual active forum for participants of the local and international, European, Mediterranean and African maritime, shipping, and energy industries to discuss, and debate, to network and learn, all contemporary and urgent themes in the shipping offshore and maritime industries in the international and in particular the African and European region. Among the topics to be analyzed and discussed is the international and regional economic and financial situation, the energy offshore business in the region, shipping, ports, sustainability, shipping markets and investments, taxes and maritime cooperation between the regions. The conference will share and debate views from top shipowners, operators, energy executives, charterers, traders, analysts, bankers, maritime lawyers, consultants, entrepreneurs, classification societies, regulators, port and terminal operators, the media, and other members of the maritime and energy industry - from this region and all over the world. The first Mare Forum Malta Maritime Summit is aimed towards the stakeholders interested in European African and Mediterranean maritime and shipping business and the region's future. Together with a very high level international audience, participants will plunge in a pool of booming business and new network opportunities which focus the African, European and Mediterranean region. - Exploring the future - the global geopolitical considerations today and in the future and examine the world economy, its energy and resource needs and challenges, trade patterns and how this will impact on the maritime industry in the world and the region. The important role of Malta in the international shipping business. The African renaissance and the effect in trade and shipping. - Global Trade, energy and commodities outlook, Supply and demand of Oil & Gas, iron ore, steel, coal and other commodities - Is confidence back? Focusing on the supply and demand for oil & gas, iron ore, steel, coal and other major commodities. This will take into account the views put forward by producers, buyers and traders from different parts of the globe, debate issues relating to the commodities markets and routing issues and the signs of improved market outlook for commodities. Views from shipbrokers, traders, analysts and shipowners and operators will be debated to examine the �Light ahead in the Tunnel' with the session examining the liquid, dry bulk and container market outlook as well as the outlook per ship type. Issues on how shipping can be profitable in a changed market economy, future shipping trends, the creation of a profitable and sustainable shipping industry and trends in shipping rates will be discussed. - The Era of Gas and Oil - Mediterranean and African Oil and Gas Exploration and production The session will also consider the role of gas in an expanding energy market, the opportunities that the offshore industry can provide to the shipping industry, the challenges and upsides for oil and gas exploration & production in the world and in particular in the Mediterranean and African region and the basics for growth in the LNG market. Attention will be given to the changes concerning entrance of the shale gas into the markets. - Innovations, Investments and Financing Issues. Especially those relating to new ships, new fuels, environmentally friendly business innovations and technological advances will no doubt draw a lot of attention. The economic issues relating to such investments, the advantages and disadvantages of such technology, the role of LNG in the future, ballast water management and the timing of implementing new regulations are certain to elicit plenty of interest. Where will the financing for these new investments come from-the banks or through private and public resources? Also attention will be given to the African shipping, offshore and infrastructures investments needed.